Slow Cooker Peanut Butter and Jelly Oatmeal made with steel cut oats, makes the best, hearty, healthy breakfast! With only 5 minutes of prep, you can prepare peanut butter and jelly steel cut oatmeal that will cook overnight for an easy breakfast that is ready when you wake up. If you love steel cut oats, check out Instant Pot Steel Cut Oats, Baked Carrot Cake Oatmeal, and Overnight Strawberries and Cream Steel Cut Oatmeal. I think you all know by now, I LOVE oatmeal. We eat varieties of oatmeal like Overnight Apple Pie Oatmeal, Peanut Butter Banana Oatmeal, and Baked Sweet Potato Oatmeal, nearly every weekday at my house. Yet, I have never shared with you my kids’ all-time favorite oatmeal recipe–peanut butter and jelly oatmeal. Friends, this PB&J Oatmeal is the MOST requested breakfast recipe at my house. It is even outranks my Hot Cocoa Oatmeal and Strawberry Cheesecake Pancakes! I am not surprised, though, as this hearty bowl of oatmeal is studded with pockets of sweet jelly and creamy peanut butter–I mean it is just a classic combination that is ALWAYS a winner! And while it is my kids favorite oatmeal, it is also a favorite of this mom, as well–because it takes me all of 5 minutes to make and cooks OVERNIGHT–so we can wake up to breakfast! I have shared with you several recipes for Slow Cooker Steel Cut Oatmeal, like Strawberries and Cream Oatmeal and Maple Cinnamon Oatmeal. I just love that with just a few minutes of prep work, I can set my crockpot to cook through the night and wake up to breakfast being made–it is almost as good as being served breakfast in bed. ALMOST!!! Grease your slow cooker with coconut oil or a cooking spray. Pour in steel cut oats. Pour in your milk, water and seasonings. Set your slow cooker to low and go to bed! Upon waking, dollop the oatmeal with peanut butter and jelly and mix until combined. Dish up for a perfect start to your day. One of the many reasons I love oatmeal is because oats themselves are healthy. BUT, what you mix into your oatmeal is crucial to building a healthy balanced breakfast, as well. Banana (optional)–I use a ripe banana in this oatmeal to sweeten the oatmeal while it cooks. It is not necessary, as the jelly will sweeten the oatmeal too, but is a great way to make this steel cut oatmeal sweet naturally. All-Fruit Jelly–be sure to use a jelly made without added sugar or artificial sweeteners. Remember to grease the inside of your slow cooker so the oatmeal will not stick to your pot–I use coconut oil as it does not burn as easily as butter and tastes delicious with nut butters. Be sure to use STEEL CUT OATS (or sometimes labeled Irish Oats) regular or quick cooking oats will not work in the slow cooker as this recipe is written. If you have an allergy to peanut butter, feel free to use almond butter or sunflower seed butter. Both are equally as tasty. Any jelly works in this steel cut peanut butter oatmeal recipe. My kids are on a blackberry kick right now, but when I have a batch of strawberry chia jam made that is my preferred choice. I do recommend using jellies that are sweetened with fruit juice, not sugars to cut back on added sugars in your diet. Of course, freshly sliced fruit, like bananas, or strawberries would be delicious on this PB&J oatmeal too. You can use any percent milk you would like in overnight steel cut oatmeal, or even a non-dairy milk if allergic to milk. If you happen to have leftover steel cut peanut butter oatmeal, place in sealed container in fridge. Warm up with a splash of milk, as needed. Peanut Butter Crockpot Oatmeal will keep in refrigerator for 3-5 days, which makes this a great recipe to use for meal prep on the weekend. Steel cut oats are cooked overnight in the crockpot and flavored with peanut butter and jelly for a delicious, healthy breakfast. Grease slow cooker pot with coconut oil (or cooking spray). Add oats, chia seeds, water, milk, cinnamon, vanilla, dash of salt and banana if using in slow cooker. Place lid on slow cooker and cook for 6 hours on low for firm texture and 8 hours on low for softer texture. Alternatively, cook on high for 3-4 hours. In morning, mix in 1/2 cup peanut butter and 1/2 jelly into oatmeal. Serve with an additional drizzle of peanut butter and jelly if desired. Be sure to ONLY use steel cut oats for this recipe. The banana is for additional sweetness and can be omitted. This sounds right up my alley! Love PB&J combo! How can you go wrong with PB&J, right?! I will be breaking out the slow cooker for this one! YAY! You won’t regret that choice Krista! 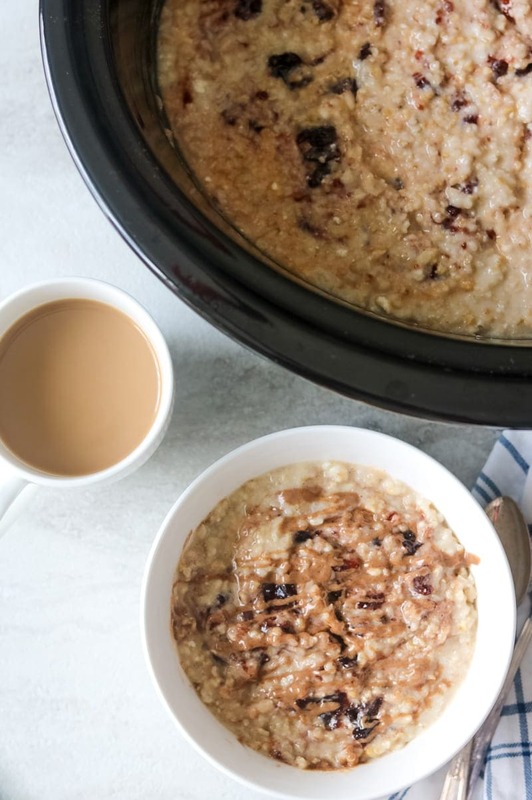 I love oatmeal and have never made it in my slow cooker… that’s going to be changing soon!! Amanda, it will make your mornings so much easier! The only thing I love more than a PB & J oatmeal, it a PB & J oatmeal that’s made in a slow cooker! So smart to use the slow cooker! Makes getting breakfast ready so easy! Immensely easier Demeter–especially when trying to get kids out the door! This looks and sounds like a great day starter! Thanks Toni–it really does gear you up for the day! OMG!!! I can’t believe I have NEVER thought of this! My kids LOVE oatmeal and PB&J so this is a genius combo! Can’t wait to try it! Your kiddos WILL LOVE this for sure Allyson! Can I make this on my IP slow cooker mode? Thank you!